Linoleum looks almost identical to vinyl, its more modern relative, but the two flooring materials need different care. Because it's a composite of natural materials, linoleum is more fragile than vinyl and can be damaged by strong cleaners. You shouldn't need them anyway; you can handle most dirt with soap and water. Unlike vinyl, linoleum needs a coat of protective floor wax that you may have to renew every year or so. Because it's created by a thick layer of hardened linseed oil, which is the main ingredient in traditional varnish, the surface of linoleum is similar to that of finished wood. This finish, unlike that of vinyl, which is non-porous plastic, can be damaged by caustic cleaners such as ammonia; they eat through the surface to create small pores that scatter light and dull the sheen. The best cleaners for linoleum are neutral-pH cleansers, such as dish soap, but you can also use a diluted solution of water and a mild household acid, such as vinegar or lemon juice, to take care of built-up grime and scuffs. Before washing your linoleum floors, you should sweep or vacuum, using the "hard floor" setting, to remove any loose dirt that might streak the floor while you're mopping. Make a cleaning solution by adding six or seven drops of dish soap to a gallon of hot water in a bucket. 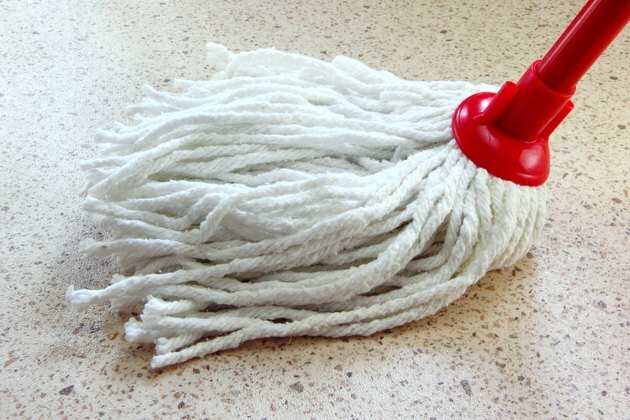 Soak a string, sponge or microfiber mop; wring it out, and mop a small, 5-by-5-foot section of the floor. Work in sections until you've finished the whole floor; then pour out the soap solution and replace it with clear water and mop the floor again. Dry the floor with old towels when you're done to get water out of the grooves in the linoleum, or it may turn the floor dingy. 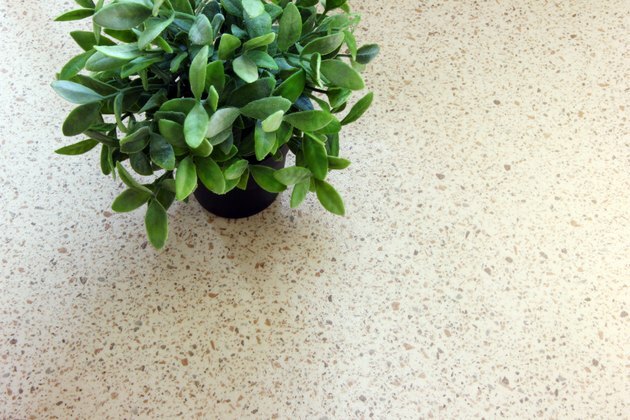 Because it's made of natural materials, linoleum fades in the sunlight, and if any part of the floor is protected from the sun, it will remain dark and may turn yellow. The best way to remove the yellowing is to expose the affected part of the floor to sunlight, but if that isn't possible, you can do it with baking soda. Wet down the affected area with a mop; then sprinkle on enough baking soda to cover it and leave on the baking soda for 10 or 15 minutes. 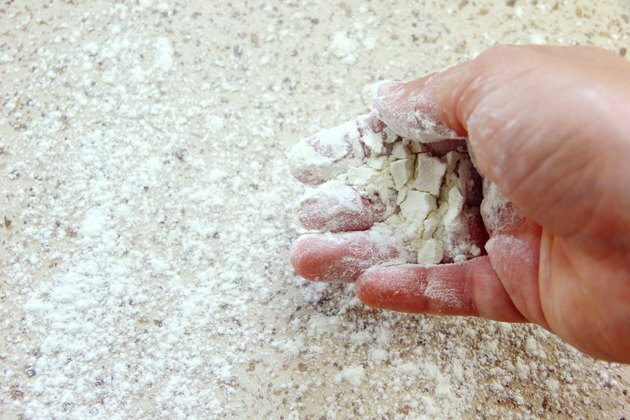 Wipe off the baking soda with a soft cloth. You may need to repeat this procedure to get rid of all the yellowing. 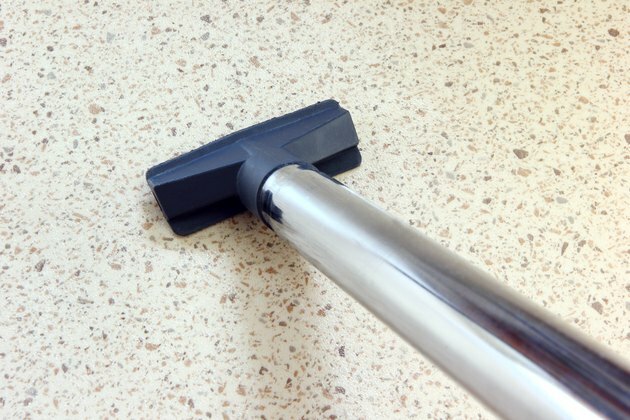 Linoleum picks up a lot of scuff marks; if you only have to remove one or two, you can simply erase them with a rubber eraser. 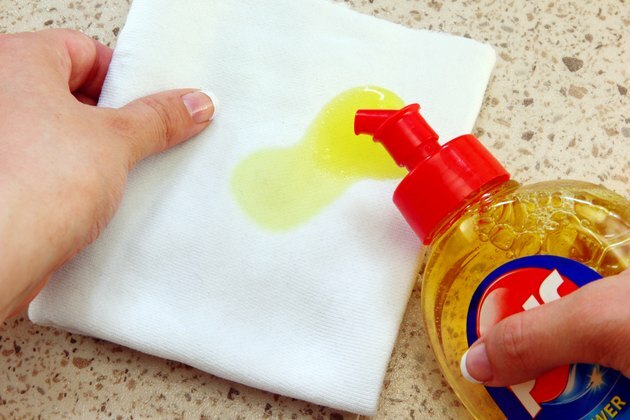 To handle widespread scuffing, as well as general dinginess, add a small amount of vinegar to your soap solution -- one part per four parts water. Vinegar should be used sparingly; strong concentrations can dull the finish. Vinegar helps to remove old floor wax, which you should do periodically to keep the colors of the flooring vibrant. 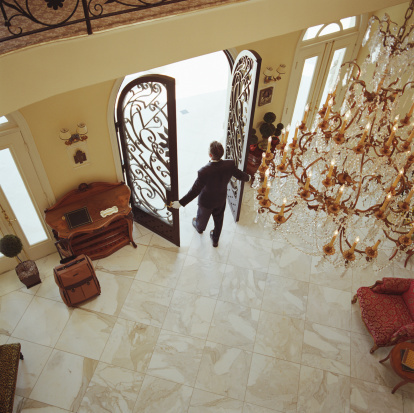 The best wax for linoleum is one that includes linseed oil in a substrate of beeswax. This completely non-toxic mixture naturally nourishes and protects the linseed oil-based floor covering.